Dill-flavored hummus, salmon, tomato and cucumber are wrapped in romaine lettuce and garnished with a sprinkling of pistachios. 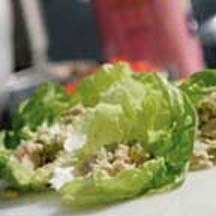 Fill each lettuce leaf evenly with a portion of the hummus, salmon, tomato and cucumber. Sprinkle each with pistachios and roll as a wrap. Recipe provided courtesy of TheGreenNut.org, through ECES, Inc., Electronic Color Editorial Services.